Crowdfunding represents a "huge opportunity" for architects looking to get public projects off the ground, according to the team behind the latest infrastructure project to seek funding on Kickstarter. "A lot of people see the potential of crowdfunding to get the public involved in a project the public will use," said Sophie Paton, part of the team behind the Thames Deckway project, which was first unveiled last year. "It's a trend that will keep on growing," she predicted. 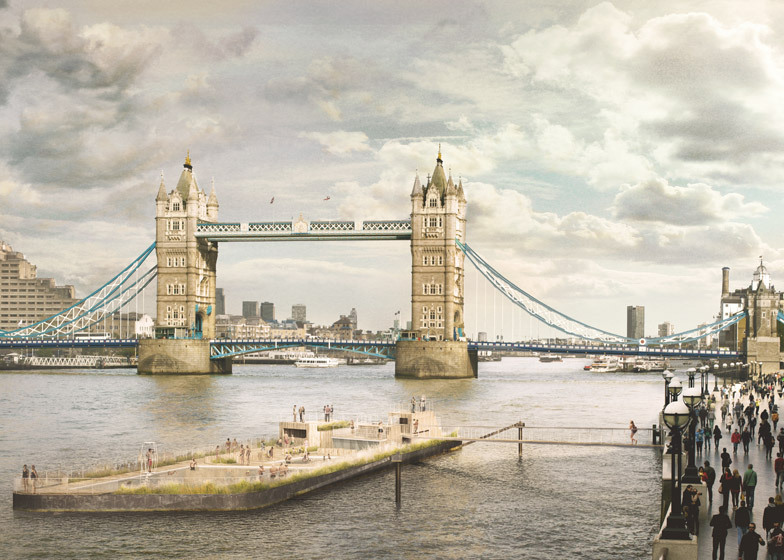 Next month the Thames Deckway, a proposed floating cycle route through the heart of London, will turn to Kickstarter to raise £250,000 in funding for the first phase of a feasibility study. Paton, who is business director at marketing agency Make Happy, is working with founders Anna Hill and David Nixon to help make the ambitious project happen. "Crowdfunding is definitely a huge opportunity for people who want to get ideas off the ground, to show the feasibility of an idea and demonstrate the public support behind it," Paton said. Paton said the decision to turn to crowdfunding sites was partly inspired by the success of the Thames Baths project, which raised over £140,000 on Kickstarter in a just a few weeks. "There's a much broader range of projects using [crowdfunding] now," said Paton. "Recently there was the Thames Baths project that received crowdfunding really successfully. That's inspired a few people to go down that route." Thames Baths, a proposal for a floating public swimming pool on the River Thames in London, is the brainchild of Chris Romer-Lee of architecture office Studio Octopi. Romer-Lee unveiled the Thames Baths concept in January 2014 but it was the Kickstarter campaign, which launched in April this year, that gave the project both funds and impetus. "It's transformed the practice," said Romer-Lee. "The contacts we've had around the world have been extraordinary. It's opened doors we never imagined. We've got incredible press and amazing exposure. We're getting jobs on the back of it." "When we started we didn't imagine we'd go down the crowdfunding route," he added. "We thought we'd go down the standard tortuous procurement route and assumed someone would parachute in with £11 million." However, an adviser from the advertising industry suggested Kickstarter – and the speed and success of the campaign astonished Romer-Lee. "We raised £142k in 30 days, which is incredible," said Romer-Lee. "We're still £11 million short but it's given us an amazing leg up to the next phase, which is looking for partners and sponsorship. We're talking to people we'd never otherwise have met." Besides generating money, the crowdfunding campaign established a global network of people who believed in the project and wanted to help make it happen, said Romer-Lee: "It elevated a utopian idea by a small practice to something with a global reach." Romer-Lee was attracted by the Kickstarter funding model, whereby backers are given rewards rather than equity in the project. However, he cautioned that launching a crowdfunding campaign takes a lot of effort and planning. "It took a ridiculous amount of time to get the info together and worded right," he said. Crowdfunding platforms, which have long been used by designers to get small-scale manufacturing projects off the drawing board, are suddenly awash with public infrastructure projects. Back in June, the creators of the proposed Lowline subterranean park in New York turned to Kickstarter to fund technical development of the project. In July, the architects behind the Luchtsingel pedestrian bridge in Rotterdam claimed their design as the first completed infrastructure project to be partly funded by crowdfunding. Initial funding for the project came via crowdfunding, after which the city put up the rest of the money. Last month Danish architect Bjarke Ingels Group launched a campaign to raise money to make a power-station chimney blow smoke rings. Dutch designer Daan Roosegaarde, meanwhile, turned to Kickstarter to fund a pilot project for his Smog Free Tower concept – which aims to remove pollution from the air above cities. Roosegaarde reached his target of €50,000 in just a few weeks and has now raised over €70,000. The pilot project opens in Rotterdam tomorrow and the additional funds will be used to take the the tower to different cities. "It's a great way to build up a community," Roosegaarde said. "It's a great way to test ideas before they get realised. It's like an online laboratory." Roosegaarde said that getting people engaged and acting as ambassadors for a project is more important than the funding they give, especially for a project with a contentious subject such as smog, which is "a problem for everyone, not just one big corporation." "The most important thing is getting the engagement of the crowd," he said. "Backers become ambassadors; they share and support the project. If you only do it for the money, there are better ways to do it." Dozens of smaller projects in the UK are seeking funding via Spacehive - a crowdfunding site dedicated to public space projects. Last year artist Luke Jerramu used the platform to raise over £5,000 to turn a street in Bristol into a temporary water slide. Back in London, Chris Romer-Lee will soon be crowdfunding another project, this time to rebuild the open-air swimming pool at Peckham in the south of the city. "Our Peckham Lido project is going down same route," he said. "We want to raise £40,000 to £50,000 to enable them to get funds from the community to take the project to the next phase." Romer-Lee believes that crowdfunding is destined to transform the way public-spirited projects are initiated. "It changes the game because it allows small practices and community organisations to get in amongst the big players," he said.